Some great tutorials from ‘very purple person’! 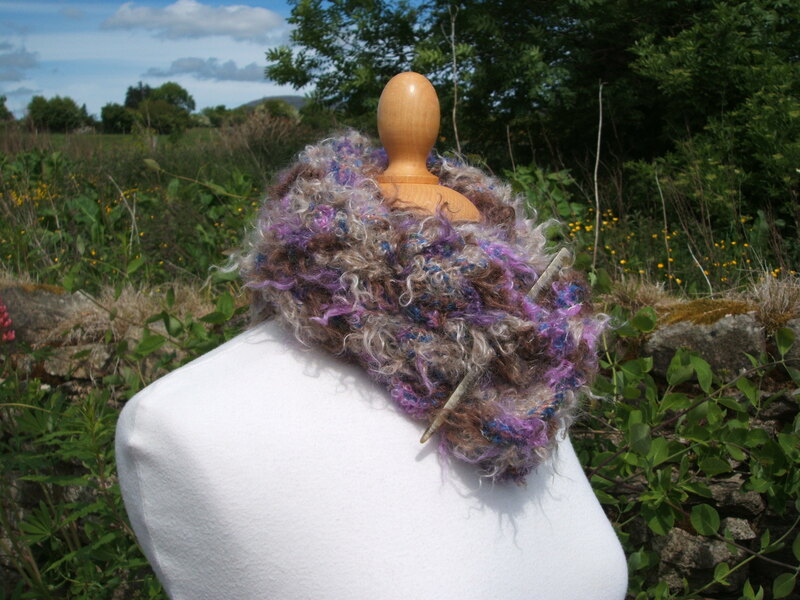 I love some of the great tutorials ‘very purple person’ has posted on the internet especially the ultra simple cowl and hand warmers created from an upcycled scarf! When I am drooling and admiring other crafters and artists work I always have my brain in gear thinking of ways to adapt the various shapes into my feltmaking and since I am SO TOTALLY out of time for the rest of this week drooling is about all I can do at the moment!!! Yesterday afternoon I spent quite a bit of time playing around with Paint, the computer programme that is and not actual oils or acrylics! 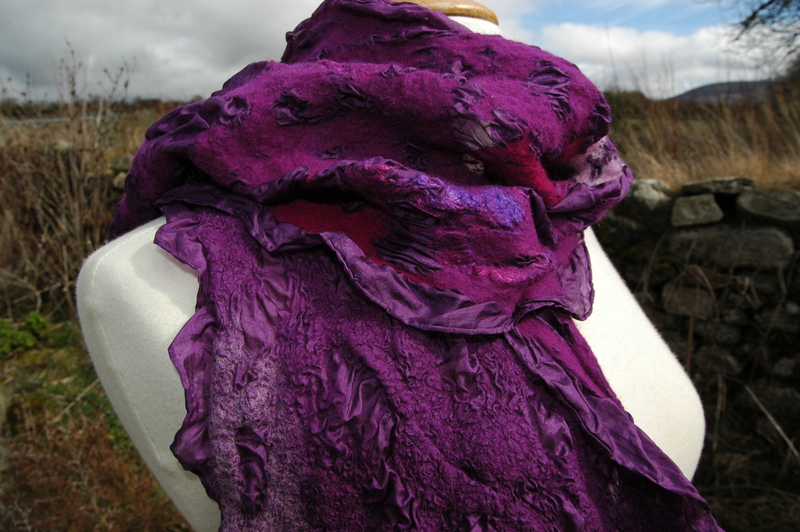 I wanted to create a banner for my new online boutique store and selected a section of this image to use as I love the colours and the textures of the printed silk and merino nuno felt scarf/wrap. It took me quite a bit of time copying, pasting, rotating, adding text, reducing the pixels etc. but eventually I was happy with the result and you can check it out below! Today I have been discounting felt accessories for a blow out stock clearance in my Etsy store and from Saturday 8th May only supplies will be sold on Etsy and all felted wearables and interior/exterior felted items will be exclusively available from the new store. 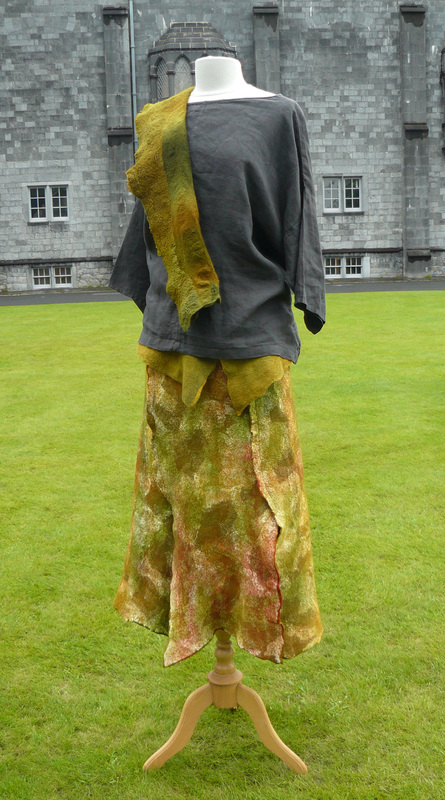 Felting, golf, puncture, food ….. This afternoon I had my second session with members of the Borris Active Retirement Group, we were examining all the different things that you can make with felt cords and balls. Everyone made a layered cord using three different colours of merino and then we had fun slicing through the felt to make gorgeous beads perfect for necklaces, bracelets, earrings, keyrings or whatever else takes your fancy! 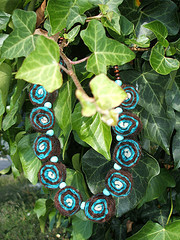 Here is an image of one of my earliest necklaces made using this method, the dark chocolate fibre is alpaca and the rest is merino. Only one of the ladies decided to leave the cord uncut, she is planning on converting the flat felt she made last week into a funky little purse and the cord is going to become a strong handle. On Saturday I arrived back in the golf club car park from supporting some mixed matches only to find that my front wheel had a puncture. This was really annoying as I was dressed in my ‘official’ clothes and had no old trousers or anything to throw on in order to change the tyre. I can’t say that any of the men (or women!) rushed in to help so thankfully one of my friends gave me a lift home after the meal and I was able to return yesterday with Alan and get the thing sorted. This is the first time that my pick up truck has had a puncture since I bought it about 3 years ago so hopefully I will get another few years before I have to go through the trauma again. I have never had any difficulty changing tyres on any other jeep or car that I have owned but for some reason the spare is amazingly difficult to get out from under the base of this truck, at least having done it once next time should be easier! I love the sound of this asparagus and goats cheese tart over at Maya Made, guess what I’ll be buying tomorrow??? Fun and simple tutorials from two of the blogs that I follow! Currently the number of blogs that I regularly follow is 178 and rising. While the majority are felting orientated I also have some fibre, art, craft, food and garden related blogs that I like to keep an eye on weekly, daily would be fantastic if I could ever get the time! Here are links to a couple of my favourite online tutorials, check out the other posts by Tiffany and Gail, both blogs are fabulous. 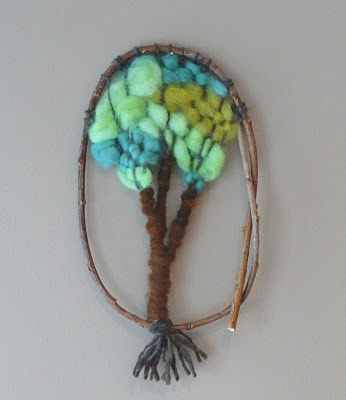 Yesterday Tiffany Teske had a gorgeous simple project on her ‘Art, Food and Motherhood’ blog to celebrate Earth Day. 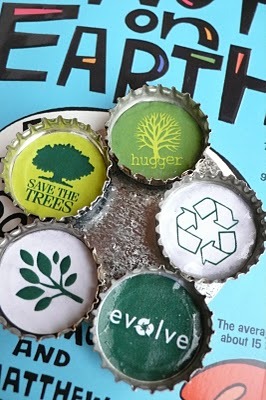 If like me you have a pile of bottle caps and magnets just crying out to be used, check out these funky magnets and head on over to follow her step by step instructions. The second project that I really love is a little weaving project which uses wool roving, this time from Gail, writer of ‘That Artist Woman’ blog. 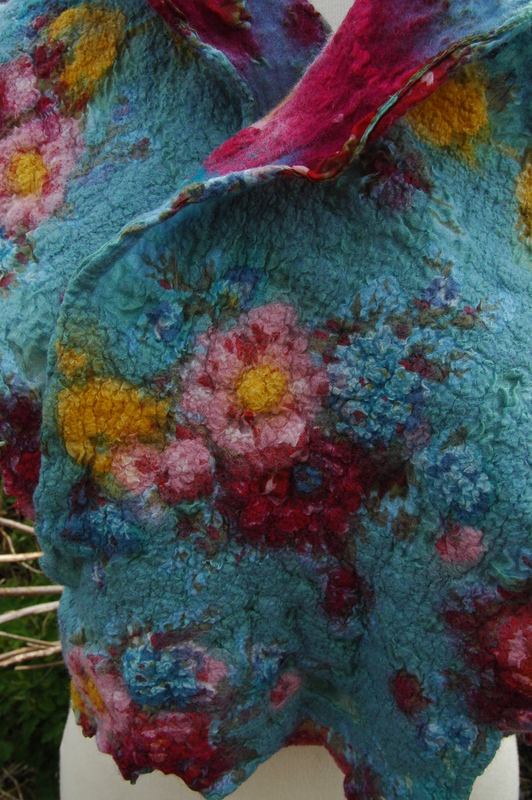 To see what I usually do with my roving or wool batts head on over to Clasheen anwhere I am just about to post about my latest felt hat in progress! Worst golf hole ever and one space left for workshop on Wednesday! Yesterday I had the worst score EVER at a golf hole, playing off my winter handicap of 13 I had a score of 18 on the tenth hole, a par four!!! Can anyone beat that?????? I used up my total handicap on one hole (with another shot over!) so as you can imagine I was not very pleased. In actual fact I don’t normally play like that (otherwise why would my handicap be what it is) but our new head green keeper had just done some work in the bunkers and for once I got totally bogged down in the sand with no chance of playing out sideways! Today my new felting tables arrived and I am thrilled. I ordered 3 long folding tables which will allow me plenty of space to work on some huge felt sculptures and large pieces of nuno felt clothing. I have one space left for a full day nuno felting workshop next Wednesday (E75 for the day) so if anyone would like to come along please email me asap. I am so excited, earth hour and moving an extremely large stone! I am so excited to be planning a fall felting trip combined with another road trip through more of the wilderness areas that are so stunning in the United States. Next week when I get a submission out of the way I am going to really sit down and try to work out all the logistics but to date the workshop possiblilties (and a couple of definites!) include Michigan, Philadelphia, Eugene, Loomis and San Fransisco, I can’t wait!!! Because Alan will be travelling with me for some of the time I am trying to have a longer block of workshops at either end of the trip with possibly a couple of single days during the middle when Alan may be with me as well. My biggest decision will be whether to fly initially to the East Coast or start the trip in San Fransisco. Alan is a great procrastinator and difficult to tie down with dates so if I can’t get him to make a final descision I am just going to go ahead and book the flights sometime at the beginning of next week if possible, this pinning down must be a man thing! If you think that you might be interested in discussing the possibility of hosting a workshop please email me asap and we can have a chat about what is involved in the organisation. Topics that I am happy to cover include mosaic nuno felt, felt jewellery, simple felt bags, complex felt bags (two days necessary), incorporating found objects into your felt, balls, cords and flowers, nuno felt scarves, simple felt vessels, the list goes on and I would love to hear from you if there is something not listed here that you would like to see covered! Yesterday evening when I returned home from the Green Party Annual Convention I switched off all the lights as my contribution to the global ‘earth hour’ to heighten awareness of global warming. Because the main farmhouse here is all whitewashed (with powdered lime) the candles I used during this time glowed beautifully against the soft white of the walls and ceilings. Speaking of powdered lime, my friend Martin Lyttle is creating a lot of stone dust in the yard down the lane as he works on his brilliant limestone cherries, a percentage for art commission he was awarded by Wexford Co Council. On Saturday I took some photos of Martin and well known sculptor Eileen MacDonagh as they worked to expose the underside of the largest piece of stone ready for Martin to continue his carving.